Hello, I'm Gregor and I put this site together. At first, you'll find an overview of recommended treadmill mats, followed by a public poll and a general buying guide on treadmill mat. Further down on this page, we do link to other well-written articles and reviews about treadmill mats. At last, you'll be able to weight in your own opinion in the comments section. If you also want to vote on the best treadmill mat, click here to view the poll. 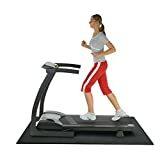 If you have a treadmill or are considering the purchase of one, you should also be looking at treadmill mats as well. Typically black in color, these come in various types, sizes, thickness and materials. It can be confusing to have this many choices especially if you never even knew you needed one. Whether you have a heavy duty treadmill, a standing desk style treadmill or a lightweight portable machine, you need a mat. It doesn't matter what kind of floor that you have, what room the treadmill will be used the most or whether the treadmill will be used and the put away or left out all of the time. You are going to need to have a good treadmill mat for a number of reasons. This guide will give you all of the basic explanations and options that are available and hopefully it will help you make the right choice. 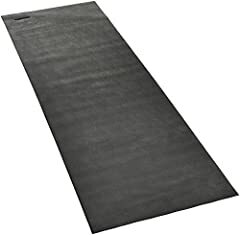 The basic purpose of the mat is protection. It protects the treadmill itself from dust which can be generated from the floor beneath it. It also helps the treadmill be more centered which prevents excessive wear and tear on one side or another. It protects the floor from the excess weight of the treadmill. It also protects the floor from potential problems like leaking lubrication if the machine develops a problem and sweat from your run. Treadmill mats help absorb some of the impact and potential jarring when you run. It reduces the noise made from the machine plus the sound of your feet as you run, jog or walk. It can also help stabilize the machine so that you feel more centered. As with anything else, it is important that you get the right size treadmill mat. You should have the basic measurements of your treadmill on hand while you are shopping with the goal of buying a mat that is several inches (at least 4-6) larger all around. This extra surface area will help to protect the floor from sweat that may fly off of you as you run. If the mat is too small, the machine may feel off kilter. If the mat is way too big it may become a tripping hazard. There are many materials for treadmill mats including single materials and composites made of two or more of the most popular types. 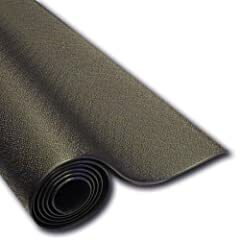 Most residential use mats are made of either PVC, rubber (or rubber composite) or foam. Each of these has its pros and cons to consider including how well they work, their weight and of course, the price. When considering the cost you should also consider the overall life expectancy of the mat. You aren't really saving money if the super cheap mat you bought needs to be replaced every few months. Of all of the types of mats, these tend to be the least expensive. They are fairly thin and may not provide enough cushion especially under larger machines or on hard surfaces like concrete or hardwood flooring. They are easy to clean but because they are so thin they tend to tear easily and may curl up at the ends. Even with lighter machines, the risk of wear through is very high with these mats. 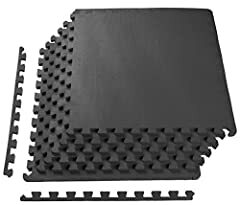 Made of either a single roll or interlocking pieces, foam mats come in a wide variety of thicknesses and can be pretty easy to care for. They are wipe clean with a damp cloth and very mild cleanser and easy to put in place. They will eventually wear through but tend to last much longer than PVC mats. 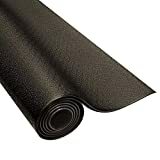 Rolled foam mats are more durable overall but may be more difficult to get under your treadmill. Interlocking mats can be taped or glued together but this could damage them if you are planning to take them apart at any time. Improperly locked, these mat pieces can slide apart and could cause your machine to be off balance. 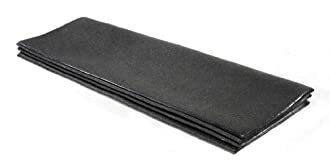 The most durable of the mat types are made of recycled tires. These will withstand the heaviest machine and daily runs on the treadmill. While these are the best bets overall they come with some serious drawbacks. First, these are the priciest of the mats. They will pay for themselves over time because you won't replace these nearly as often as the others but you have to be ready for that upfront cost. Second, since they are made of rubber/recycled tires they do often have a pretty strong odor that may persist for several days or a few weeks. Eventually the smell will go away or will fade enough to ignore but for the first few days there will be little that can be done to cover it. This is especially noticeable if the treadmill is inside of your hose or apartment. 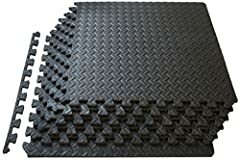 Rubber mats are heavy and may not be easy to move by yourself. You may need to have help unrolling it and setting it up under your treadmill. 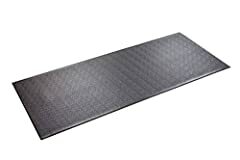 If you are going to leave the treadmill in one place, the mat should be properly sized so that it provides enough protection on all sides without causing tripping hazards. It should also be durable enough that it is not going to wear out and need replaced all of the time. 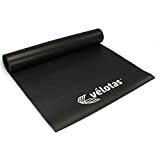 On the other hand, if you put your treadmill away when not in use, you will need a mat that is easy enough to roll up and store alongside the machine without struggle. That may mean using one of the less durable but lighter options like the foam or PVC. It will also mean working to get the mat in the correct position under the treadmill every time that you plan to use it. Make sure that you know what the most important factor is for you and then choose the best mat for the money that will give it to you. New: Our editorial list of additional articles. 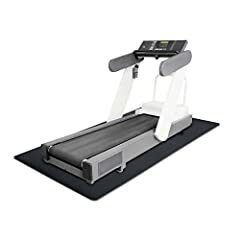 We decided to gather informartion all around the internet and present you a list of helpful, external links to interesting reads about the best treadmill mats and their reviews and guides. You're not convinced by the previous writings about treadmill mats? Of course you can just choose by visual impression, that's why we present you all our chosen products at a single glance. A click on any image is enough to open an external link to the best offer we could find. Finally, we want to present you our rating criteria for our treadmill mat comparison, so you can better understand and comprehend our recommendations and the rating process itself. Furthermore, we still ask you to keep your eyes open for short term deals in order to make some great bargains with treadmill mat in 2019. Published by G. Krambs on StrawPoll.com (last update on 2019-04-23 08:22:26). 10 of 18 readers found this article helpful.